All special Internet rates are incorporated in the rates displayed on this web site. If you find cheaper rates in Las Vegas, then you are probably sleeping in your car. Golden Palm Hotel Casino Las Vegas is just off Interstate 15, about one mile west of the Strip. 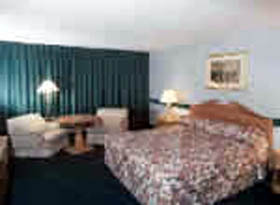 It is within two miles of the Sands Expo Convention Center and the airport. Adequate accommodations for leisure and business travelers seeking easy access to the Strip at off-Strip prices, Golden Palm Hotel Casino is also popular with visitors and locals attracted by our lively karaoke lounge. Our unheated, 35-foot pool surrounded by a sundeck provides seasonal swimming. A 10-person spa tub surrounded by a sundeck offers soaking year-round. 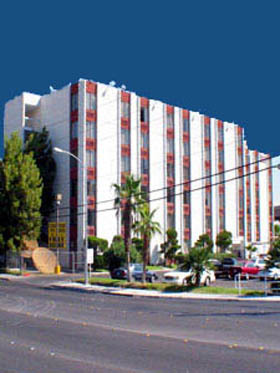 The nearest major hotel, Excalibur, is one mile away at the intersection of Tropicana Avenue and the Las Vegas Strip. Occupying the intersection's other three corners are the MGM Grand, the Tropicana, and New York New York. Our lobby kiosk provides high-speed Internet access (surcharge). 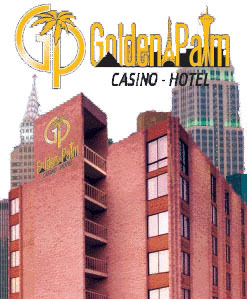 Golden Palm Hotel Casino offers 150 air-conditioned guestrooms in a six-story tower. Room decor varies, but all rooms feature textured, salmon-colored wallpaper, carpeting, and two-chair dining sets. Fabrics come in either burgundy or peach. Karaoke takes place in Golden Palm Hotel Casino's lounge nightly. Karaoke tournaments and other special karaoke events occur frequently throughout the year. Live music and complimentary appetizers are provided in the lounge early Friday afternoon and evening. Golden Palm Café restaurant offers burgers, sandwiches, salads, pork chops, steaks, and breakfast menu. Low-priced specials.